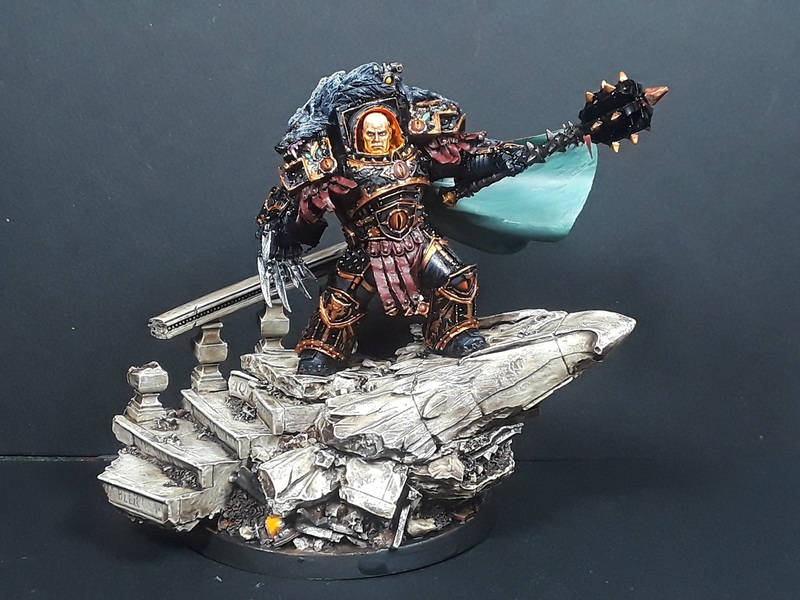 Mordian 7th Regiment: Heresy Era Sons of Horus - Horus the Warmaster complete! 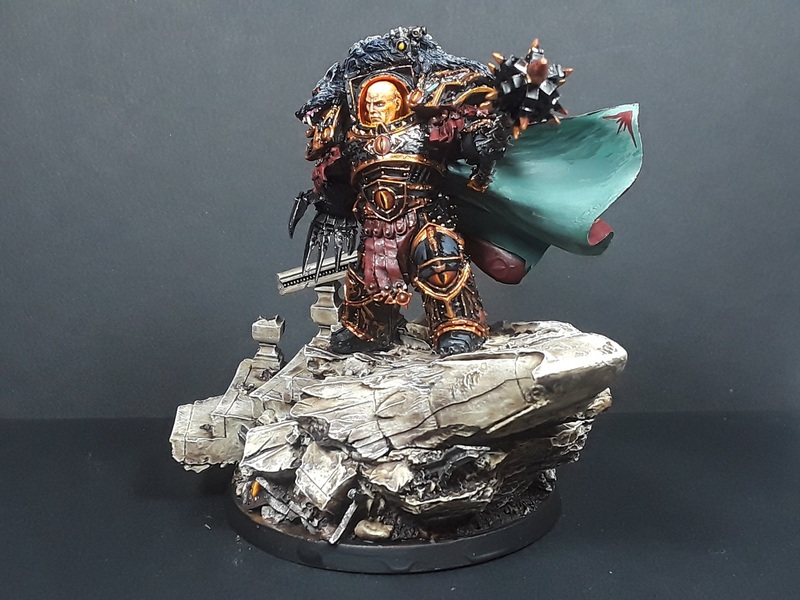 Heresy Era Sons of Horus - Horus the Warmaster complete! Another three hours of work in after work today, and have called it finished for the big man himself. Well, he hasn't been sealed yet as the weather has taken a turn for the chilly and I absolutely don't want to take a chance on frosting the model at this point! A little cleanup here and there, some further washes on the metal to give it more depth, and he's ready to march on Terra! 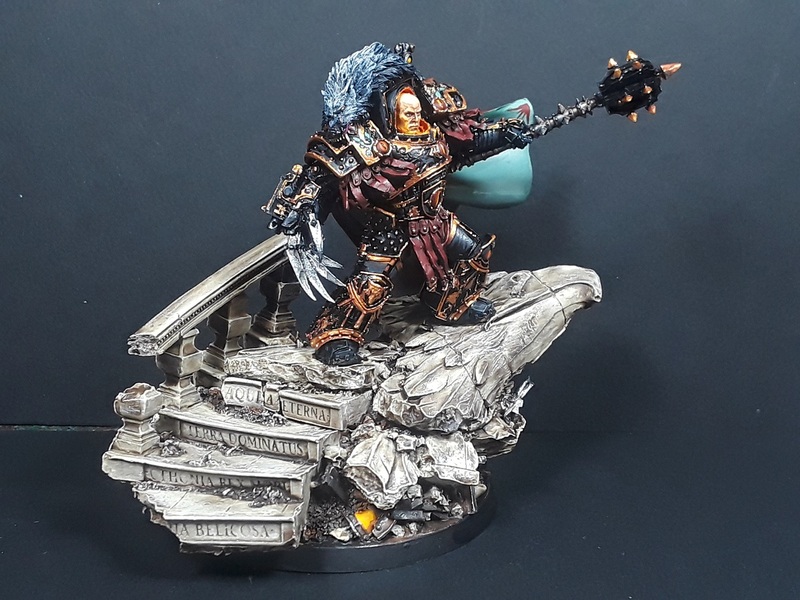 Painting this model is a bit of a hobby milestone for me - I've always wanted to take a crack at him since it was released but wanted to wait until I felt I could do it justice. Added a little flourish to the interior of the cape, but didn't want to go overboard. 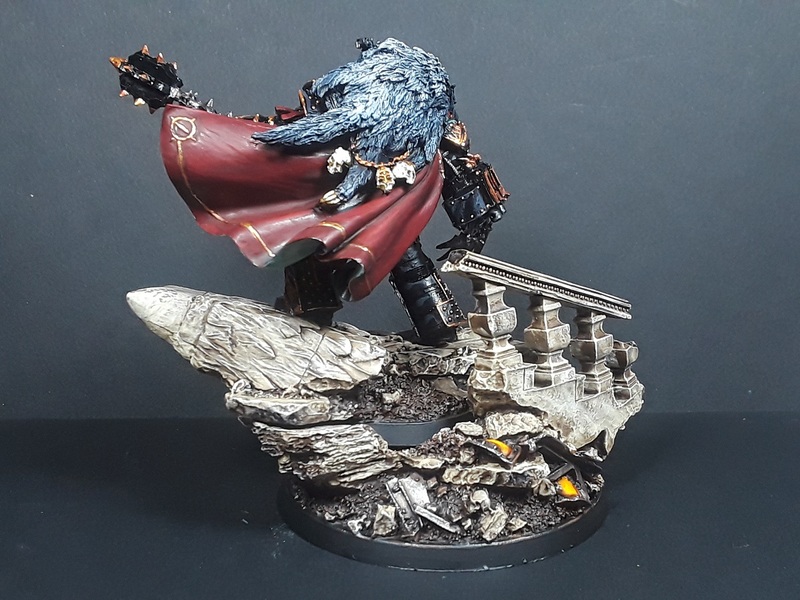 I've seen some truly amazing freehand done by others, but I know my limitations and inexperience and this is NOT the model I wanted to be practicing on! I was pretty happy with the obsidian head on Worldbreaker, it'll have a slick glossy finish added once the matte spray sealant is applied, should help distinguish its black from the black of the armour in both tone and color. I'm pretty sure this is the best face I've ever done, which I expect is more than half due to the fact that it's about twice the size of a normal marine face so there was plenty of room to work! Really happy with the OSL effect - I probably could have pushed it a little further, but I always say "less is more" when it comes to weathering, blood spatter, and the the like. I was honestly terrified the entire time I was painting it, and the fear of going too heavy-handed and mucking it up completely kept me from going overboard. Looking at pictures this blown up is always a sobering moment for any painter, where every little flaw and brushstroke is shouted into one's eyes. There's all sorts of things that leap out at me as being ham-fisted, but even so this is probably the first piece I've painted that has made me seriously consider entering it in an event painting competition like NOVA or Adepticon. I absolutely know that I'd be destroyed by the hugely talented artists, but I think I could still hold my head up and be proud of the entry! Really enjoyed painting him but I think it's time to do something messy and fast next as a way to loosen up - Going to finally build and paint the Galvanic Servohaulers set I picked up a while back. Experiments in weathering ahoy! good job! 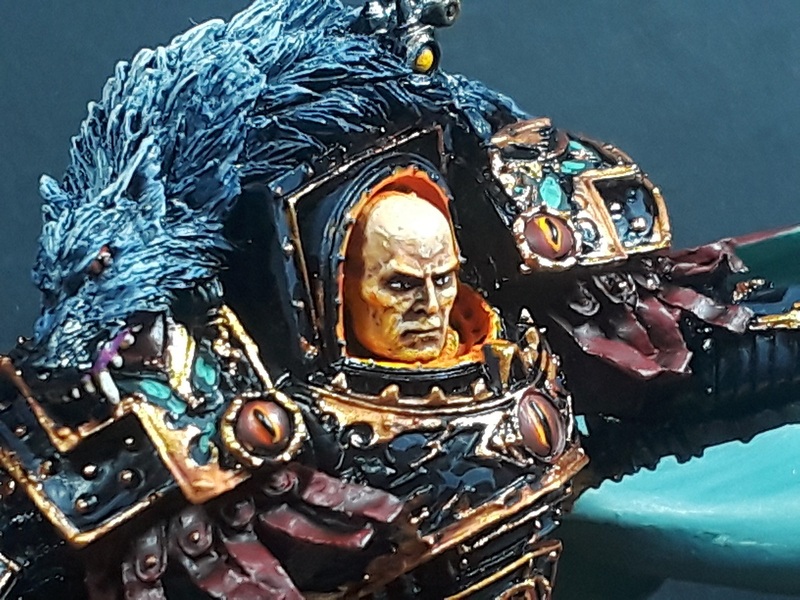 osl is better with less fro sure it's too easy ti tip the scales, that said you would have only had to strip and repaint the head ;) Great work, leveled up on this one! Smashed it out of the park, bro! Beautiful. You'll have to do OSL on everything now! 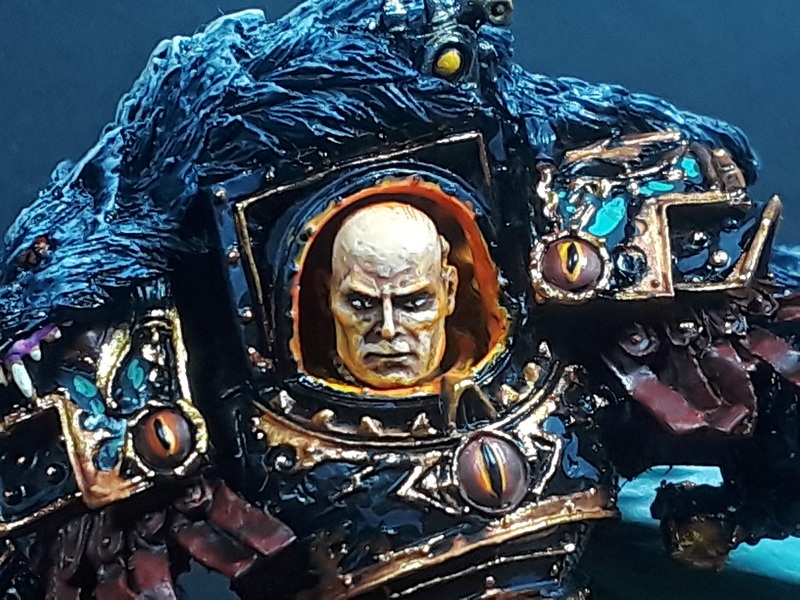 The level of detail on the model is off the chart so how you managed to do this in 4 days is mind boggling. 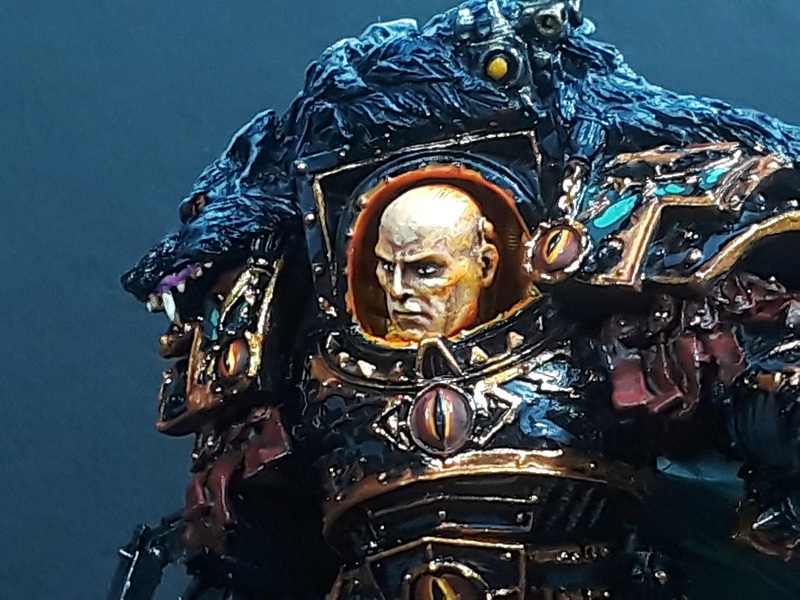 Love the osl on the face. He is awesome, I love seeing the brush strokes, his face in particular is so expressive because it's 'painted'. I always feel that as a compliment it may sound like a criticism but it's truly not. Those who practice realism are amazing but I think applying a painterly style shows a confidence in your own technique, even if you were sweating through the process. Great stuff, brave to take such close up pics, but it's worked out for you! Well played good sir. Well played indeed. Some great work there. @Zab: Thanks very much, man! It definitely felt like a step up! @Siph_Horridus: Cheers, bud! I'm really jazzed at how he turned out! @Riot: Haha! One big green square smack dab in the middle! @Stonedrose: Haha! Thanks - it's always scary to look at super close-ups, but I do find it helps me understand where I can improve! @Rory Priest: I appreciate it! It really was a blast to work on! @Zeuso: Cheers! The marble effect was a bit of a hack job if I'm honest but it turned out pretty decent - I started with a basecoat of Vallejo Beastly Brown, then liberally drybrushed Bleached Bone over the top leaving just a tiny bit of the brown down in the deepest recesses. The bone is slightly translucent so the brown undercoat 'shines' through and keeps it a fairly warm tone. I added some thin streaks and did some edging with Pale Sand, then basically mopped the whole thing with Army Painter Strong Tone wash, makign sure that the brush strokes I was using to apply the wash were in the same direction as the streaks I'd painted. I let it dry thoroughly overnight, then came back and gave the whole thing a super light drybrush of Bleached Bone again - Easy Peasy (though time consuming waiting for the wash to dry)! Thanks so much for all the kind words, everyone! Well looking good as far as I'm concerned. A great job on a fantastic model! Also, have you considered using brush on primers and sealers? They work great especially when weather won’t cooperate for spray products. I switched years ago to vallejo and have never looked back. Love the way the lighting came out inside his suit. Really nice work. Yep. Looks like he'll crush everything in his way. @Will B: Thanks very much, man! I've mostly used brush-on gloss for a shine effect on gems, but haven't really ever tried a brush-on matte. I'll have to give it a whirl sometime soon! Gawds damnit mate! That is effin sweet work. Yep, definitely your best work that I've seen and very much worthy of being entered into a competition I feel.